ISLAMABAD: Amidst reports of new threatening statement from various leaders of Tehreek-e-Labbaik Pakistan (TLP), Ashiq Masih , the husband of Aasia Bibi, acquitted by the Supreme Court in a blasphemy case has appealed to US President Donald Trump for refuge, citing danger to family members’ lives. He has also appealed to the United Kingdom, Italy and Canada for assistance. “I am requesting the President of the United States Donald Trump to help us exit from Pakistan,” Masih said in a video recorded by the British Pakistani Christian Association and seen by Reuters. 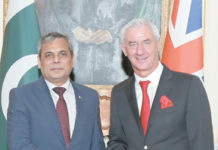 “I also request the Prime Minister of the United Kingdom to help us, I also request the Prime Minister of Canada,” he said, while also asking for help on behalf of his brother Joseph Nadeem who has assisted with Bibi’s case. Canada urged Pakistan on Tuesday to ensure the well-being of Bibi as her life was in danger after her acquittal. The US Embassy and British and Canadian High Commissions in Islamabad did not immediately respond to a request for comment on the video. Earlier, in an interview with German broadcaster DW, Bibi’s husband said he and his family were “frightened” after Pakistan’s authorities struck a deal with Tehreek-i-Labbaik Pakistan in order to end protests over Aasia Bibi’s acquittal. UK MP Tom Tugendhat, who chairs the Foreign Affairs Committee in Parliament, said he had asked the Home Office for an “urgent evaluation of the situation”, the Guardian reported. Prime Minister Theresa May has stopped short of welcoming the release of Asia Bibi during Wednesday’s Prime Minister’s Questions. Tory MP Fiona Bruce asked whether she welcomed her acquittal by Pakistan’s Supreme Court. Theresa May told MP Fiona Bruce the news would be welcomed by her family “and those who have campaigned in Pakistan and around the world for her release”, and the UK was committed to the global abolition of the death penalty. “There will be a war if they send Aasia out of country,” TLP leader Khadim Hussain Rizvi said after the deal with the government was reached to call off the protests. Pakistan’s Information Minister Fawad Chaudry told BBC that security had been “beefed up” to protect Aasia Bibi. “Yes, there is a situation and we are dealing with it, but I assure you that her life is not in danger,” he told the broadcast. He described the government’s deal with the protesters as “firefighting”, saying it helped to “resolve the situation without resorting to violence”. Director General (DG) of Inter-Services Public Relations (ISPR) Maj Gen Asif Ghafoor on Friday distanced the army from the controversy surrounding Asia Bibi’s acquittal, saying that the decision had been taken by the courts and the army had nothing to do with it. Speaking to PTV News, the DG ISPR advised religio-political parties protesting against the Supreme Court judgement on Asia Bibi’s appeal to seek a legal solution to their grievances. “We are tolerating a lot,” he added, pointing out that there are certain limitations imposed by the Constitution on what can be said about state institutions, and that action could be taken in case of violation of these. He also urged the protesters not to divert the army’s attention to “other matters”, saying the forces are engaged in a fight to defeat terrorism. “The armed forces, along with the rest of the country, have fought a war that we are about to win,” said Maj Gen Ghafoor. “Our goal is long-lasting peace. 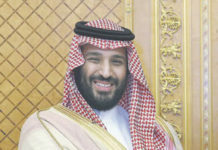 We have established peace and we are headed towards stability but there is still a lot left to do,” he said. “The armed forces hope that this matter is resolved without disruption of peace,” he said, urging the people to unite so that the country can move forward. The DG ISPR added that “even though the army had nothing to do with [Asia Bibi’s] case”, the forces still wish for the matter to be resolved peacefully. At the same time, he warned that action would be taken as per the Constitution if matters escalate. 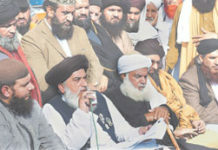 In answer to a question about Tehreek-i-Labbaik Pakistan (TLP) chief Khadim Hussain Rizvi’s statement, where he had alleged that the armed forces had threatened to “destroy” his party, Maj Gen Ghafoor explained that members of the Inter-Services Intelligence were part of the delegation that was sent to negotiate with the protesters. He said that it was up to the government to decide what steps it wanted to take to tackle the situation and said that the army would only take action against protesters if the government asked for its assistance. Italy said on Tuesday it would help a Pakistani Christian woman, Aasia Bibi, leave her country because her life was in danger following charges of blasphemy that put her on death row for eight years. Italy is working discreetly on the case with other countries, he told an Italian radio station. In the interview with the radio station, Salvini was asked to respond to Aasia’s husband’s appeal. Aasia Bibi’s lawyer Saiful Mulook will seek political asylum in the Netherlands, Dutch news website NU.nl reported on Tuesday. “I am waiting for an offer from the Dutch government,” it quoted lawyer Saiful Mulook as saying. Mulook, who said on Monday he fled Pakistan on Saturday because of fears for the safety of his family, was now sheltering with a Dutch group, the Association for Persecuted Christians, and had no idea where Bibi was. Several parties in the Dutch parliament have said they support providing temporary shelter to Bibi if she flees Pakistan. Reasoning that a petition to review a Supreme Court verdict, in the case of a Christian woman acquitted of blasphemy, would have no impact on the judgement taken last week, Aasia Bibi’s lawyer said on Monday that he expected her to be freed soon. “It is not a rehearing of the case where evidence will be presented again. The Tehreek-e-Labbaik Pakistan (TLP) has to show from the judgement what they think is incorrect,” Mulook told Arab News on phone, after addressing a press conference in Netherlands, on Monday. He added that in any review petition, there are five percent chances of the verdict being in favor of the petitioner. However, in Bibi’s case, there are zero percent chances that the judgment may be reversed. The United Nations on Tuesday denied that it had forced Saiful Mulook, the lawyer of Aasia Bibi, to leave the country. Saiful Mulook had fled to the Netherlands after violence erupted over the Supreme Court’s decision to overturn the conviction of Aasia Bibi, who was on death row until her acquittal. Federal Minister for Religious Affairs and Interfaith Harmony Noorul Haq Qadri while speaking to the media on Tuesday said that the court would decide on the matter of placing Aasia Bibi’s name on the Exit Control List (ECL). The government and Tehreek-i-Labbaik Pakistan (TLP) had on Friday reached an agreement after which the latter ended its three-day-long nationwide protests against the Supreme Court’s acquittal last week of Asia Bibi who had been sentenced to death in 2010 for blasphemy. One of the points both parties agreed on was that the government would “initiate the legal process” to place Aasia Bibi’s name on the no-fly list. “The TLP also said that some miscreants used their platform to damage public property and had behaved inappropriately. The state will take action against them. We stand by the agreement, and it will be acted upon,” Qadri asserted. When asked whether the TLP would be banned, the minister said that there was no plan to ban the TLP. “However, if someone’s intentions or designs are in conflict with the national narrative and policies, then hopefully steps will be taken against them,” he replied.